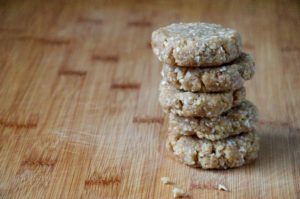 Try these super amazing raw Walnut Cookies! Not only will they keep you satisfied but are jam packed of good fats to improve your cholesterol. formed, (about one minute) and until all nuts and seeds have been crushed. Using a tablespoon, take some mixture, roll into a ball and then flatten between your palms. Place on some baking paper and press half or a full walnut on top for decoration. Keep in a container in the fridge, cookies will last approximately one week. Makes 22 cookies.